I grew up playing the skee ball machines at the Jersey Shore boardwalks. No arcade would be complete without skee ball. But, until recently I had no idea there were skee ball machines for home use. If you want to have an epic game room (and have the space) then these are the best options I’ve found for bringing the boardwalk into your basement. Let’s cut right to the chase. If you want to know the best options out there then here they are. 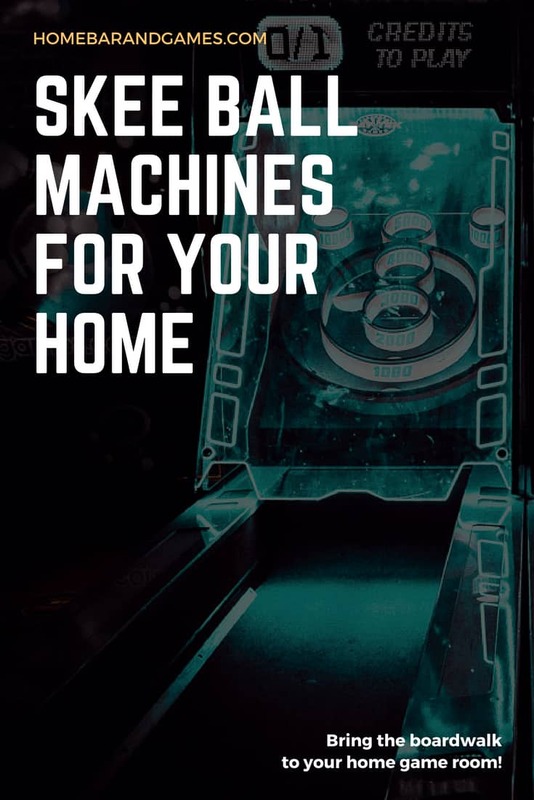 If you want to learn a little more about skee ball machines and whether or not one would be a good fit for your basement, home bar, or game room…then keep reading because I’ve got that covered too. This is the classic skee ball machine that you’ve put hundreds of quarters into over the years. This is also the machine that you’ll see being used at the National Skee Ball Championships every year so you know this is the real deal. This machine is big, heavy, built like a tank, and expensive. But if you want an authentic skee ball machine just like the boarkwalk arcade you spent so much time at as a kid, this is the one. If you follow the instructions and take good care of this machine, it should last forever. Let’s face it, it will get a lot less abuse in your home bar or game room then the ones at the arcade. You can check the latest price on Amazon HERE. This table is a great place to start if you aren’t ready for the real deal. The real arcade style skee ball machines are all well into the 1000s of dollars. But you can get this table for under $1000 and it still gives you a great and fun skee ball experience. Hathaway is a company that make a lot of different game tables. They have a pretty good reputation for quality tables. They never seem to be the top performed for any one type of gaming table, but they make just about every kind of table and do a pretty decent job at it. A couple of thing to keep in mind though. This is not the same type of skee ball that you are used to playing at the arcade. This is a great table if you have limited space or want to get a skee ball machine without having to take out a small loan. It even folds up when you aren’t playing it so you can save even more space. It is also made by Hathaway, although it is a lower quality model than the “Boardwalk” above. It is relatively well made and durable but probably won’t stand up to constant use like the more “professional” models. If you are really set on getting a skee ball machine and have limited space, this is a great option. It also makes a great present for smaller kids as they won’t care that its not a “real” skee ball machine. If price is no object then you need to check this one out. The Centennial Alley is a throw-back to the vintage Skee-Ball alleys of the 1930s. It’s has an art deco look of the 1920s and 1930s Skee Ball alleys. It even has a ball release lever and flip score display like the original 1930s alleys. But don’t be fooled, the interior is 21st Century, with modern electronics. The alley was created for both enthusiasts and collectors that enjoy a throwback look with modern build quality and technology. First time looking to buy a skee ball machine? There are a few really important considerations you need to consider before ordering one of these incredible devices. Skee ball machines are big. Ok, you probably knew that. Aside from the cost, a good machine requires a significant dedication of space as well. The standard arcade version described above is 10 feet long and about 3 feet wide (not to mention about 7 feet tall). So if you want that one, you’ll need a substantially sized home bar or game room. If you don’t have significant space then check out the smaller “table game” style skee ball machines. These aren’t the real thing but they are a lot of fun and perfect for families and kids. How Much Do Skee Ball Machines Cost? The real deal arcade style skee ball machines are going to cost you over $5000 brand new. You can look at used ones but then you’ll need to be able to figure out if it is in good working order or if its been abused by 12 year olds or corroded by salt water at a boardwalk arcade for 30 years. There are also more affordable options (like some of the ones listed above) that are really well made and a lot of fun. The only downside is that they really aren’t the same as the skee ball you know from the arcades. My advice would be to check out the prices on the skee ball machines above and find one in your budget. They are all great and just because you don’t want to spend the money for an “authentic” machine, you shouldn’t give up on having a home skee ball game. First and foremost, you want a sturdy and durable build quality. Skee ball machines take a beating…more so that a lot of other games. It’s just the nature of the game that kids (and adults) will be slamming balls down the lane (sometimes much too agressively) over and over again. So build quality is important. You need to consider how the machine will be used. Now that you’ve got your skee ball machine, you need to know how to win. Or maybe you want to hustle some 12 year old out of some tokens down the shore. In order to roll consistently, you need to find yourself a consistent stance that works. This might be different for every person, but here’s a good place to start. Put your right shin (for right handed rollers) against the front of the lane. The left to right position of your shin can vary from player to player so find a spot that feel good to you when you roll and gives you good results. Place your other foot slightly back and to the side to give yourself a stable base. Shorter people have an advantage at skee ball. The lane is fairly low to the ground and you want to roll the ball smoothly down the lane (instead of letting it drop). So you need to bend over and get low enough that your hand hangs almost to the surface of the lane. Too low and you’ll hit the metal flashing on the front of the lane though! So be careful. The fewer parts of your body that are moving when you throw the ball, the more consistent you can be. Find a good (low) body position first. Then use only an arm swing to roll the ball. If your body is also moving then that will throw off your aim and feel. You want to know that you can repeat the scoring roll over and over again and eliminating all unnecessary moving parts makes that much easier. Similar to minimizing moving parts when throwing, you want to avoid variations in your grip. It may take some practice to figure out what grip of the ball works best for you, but once you find one, stick with it for a while. At the very least, don’t change it during a single round. Try starting with the ball in our middle three fingers and letting it naturally roll off the finger tips as you swing your arms. This might surprise you but most skee ball games are won by the player that hits 40s consistently (and maybe mixes in some 50s if you’re at the higher levels). If you are rolling 9 balls and get them all in the 40, that gives you a 360 score. That’s really good! Practice hitting the 40 on a consistent basis and you’ll be tough to beat. If you are going head to head and find yourself behind after missing a 40 or two, then you need to throw caution to the wind and take a shot at the 100. Make it and your back in the game, miss it and you almost certainly have lost.